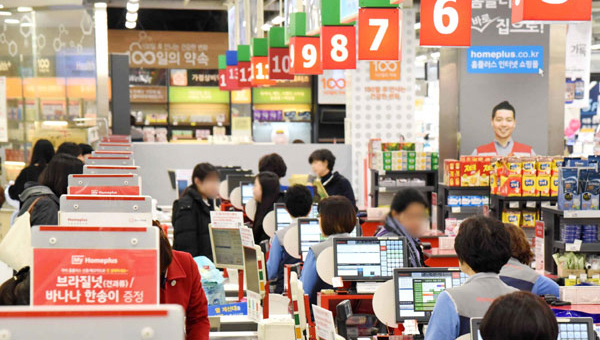 Homeplus, one of Korea’s three major grocery chains, Thursday said it has agreed with its labor union to promote 12,000 contract workers to permanent status regardless of their working years, normalizing walkout-ridden shops ahead of the busy Lunar New Year’s holiday. Homeplus employees began picketing last November and went into partial walkout this week. A full strike was avoided after the management and union reached a preliminary agreement on wage and other labor terms for this year. The retail chain owned by MBK Partners, Korea`s largest private equity fund, had grappled with union protests in the pay battle. Contract workers accused MBK of attempting to use “tricks” in raising the compulsory minimum wage, while reducing the workforce to cut costs. MBK acquired Homeplus in 2015 from British retail giant Tesco for 7.2 trillion won ($6.4 billion). The agreement included a plan to place contract workers on permanent payroll. If realized, Homeplus would be the first large retailer whose employees are all full-time staff. Homeplus said the achievement was made after the labor union agreed to the management’s bold decision to make a workplace with greatly improved labor conditions. The company said it will deliver on the conversion plan without establishing a separate subsidiary. Last year, Homeplus granted a regular worker status to 1,200 contract workers who had worked for 12 years.